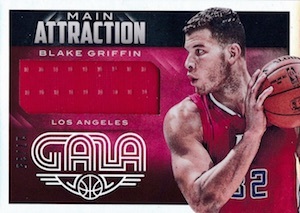 2014-15 Panini Gala Basketball marks the brand's debut, one which takes on something of a Hollywood theme (and nothing to do with apples). Each box of the high-end release has five cards: three autographs serial numbered to 60 or less and one memorabilia card and one base card numbered to 99 or less. The set's rookies are some of the rarest in basketball card history. 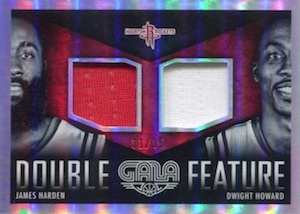 Another wrinkle on the product -- 2014-15 Panini Gala Basketball is being produced for the international market and not North America. 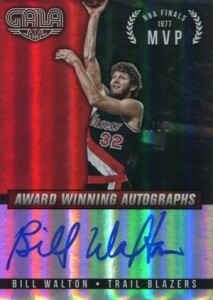 Base veteran cards in 2014-15 Panini Gala Basketball are somewhat rare, with just 99 copies each. They offer two photos of the player -- a portrait on top with a black and white action shot on the bottom that's something of an accent. 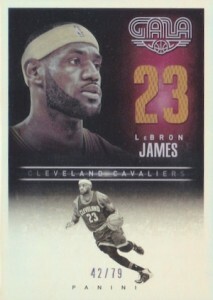 Rookie cards take on the same general design, however they're numbered to 8. This puts them in line as one of the toughest rookie cards the hobby has ever seen. The base set has 100 cards, which breaks down to 83 veterans and 17 rookies. With no basic inserts to speak of, Gala has a relatively small number of hit-based chase cards. This includes five different autograph inserts and three memorabilia themes. 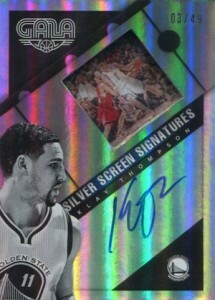 Cinematic Signatures, which are available for both veterans and rookies, mix acetate and holographic foil. Besides the autograph, the wide-angle action shot stands out as far as design elements go. Other signed sets include Silver Screen Signatures, Award Winning Autographs and Starring Role Signatures. Jim Jackson 2014-15 Panini Gala Green Cinematic Signatures Auto 25 25! Ebay 1 1! 28 cards. Serial numbered #/60. 30 cards. Serial numbered #/35. 22 cards. Serial numbered #/50. 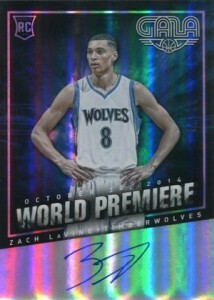 another overpriced product by panini..let me guess? 4 cards per box at $400 srp…. and then 5 boxes per case? 1-2 new ‘high end ‘ product. Ridicolous. With ‘high end ‘ price on every product we just hope max 1/2 money back. 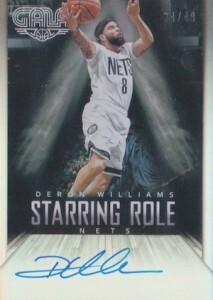 Downfall era to the basketball cards. Anyone else find it a bit odd that the season ended months ago and we are still seeing products release from it? Bit disappointing to see points cards in a product where release was delayed for so long. Sure, it’s high-end in your wallet but not the cards, if you know what I mean. Panini…the foreign company where QUANTITY trumps QUALITY! Still missing you Topps, Fleer and Upper Deck! favorite player . lost the fun about collecting cards . this is not a hobby anymore , this is ripping money out of people’s wallets . 400$ for a box …4 cards …after National Treasure were i have done 18 case breaks and got not one decent card !!! i have got it with Panini . 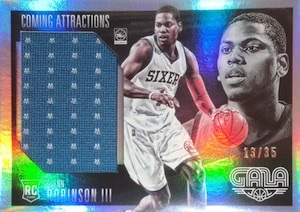 2014-15 PANINI GALA NBA HOBBY FACTORY SEALED BOX: WIGGINS JOEL EMBIID RC AUTO?